Looking for a new and fun corporate event? 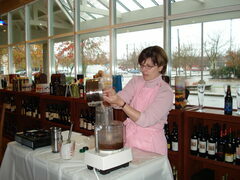 Why not a truffle making class led by Melissa or Ellen! Each participant goes home with a 12-pack boxes of chocolates and the recipes to make chocolates at home. The 12 pack box they take home has a retail value of $30! The classes last about 2 1/2 hours. You can come to our facility or we can come to you. And it is easy for you. We bring all the equipment and supplies. Prices: $50 per person at our facility. $45 per person at your facility. Minimum 8 / maximum 12 people. Classes are also available for wine shops to sell as a great way to bring in new clientele and make money in the process!